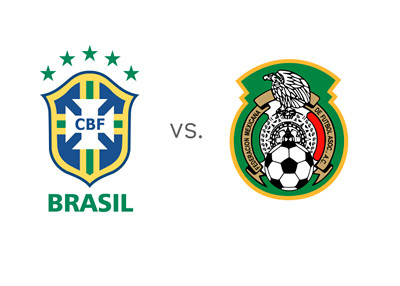 Brazil and Mexico will play in the second round of games in Group A of the 2014 FIFA World Cup at Estadio Castelao in Fortaleza on Tuesday, June 17th, 2014. Brazil beat Croatia 3-1 in the tournament's opening game and will look for a victory in the upcoming match vs. Mexico, hoping to finish first in the group and avoid facing the red hot Netherlands in the round of 16. Neymar showed great form in the opening match and so did the team's playmaker Oscar. Mexico outplayed and beat Cameroon with the score of 1-0 in their opening match. Although they are the underdogs vs. the host nation on Tuesday, Mexico will look for something out of this match, knowing they have to face a fairly strong Croatia side next. The standout player from the first game for Mexico is their forward, Giovani dos Santos. Brazil are the huge favorites in this game. They are playing well, they will be supported by their fans and potentially also by the FIFA referees, if the first game is any indication. Can Neymar, Thiago Silva and David Luiz continue their winning run? Can Mexico produce an upset?